Ad Bac 4227 is a cleaner and disinfectant designed for institutional use such as hospitals, nursing homes and institutions where housekeeping will be be of principle importance in controlling the hazard of Cross-Contamination. Hard surface disinfection can help in this control and can provide the assurance you need area, when used as directed for use on floors, walls, sink tops, garbage pails,telephones, rest rooms, bed pans and operating rooms. Effective against Staphylococcus aureus, Salmonella choleraeuis, HIV (Aids Virus),Psuedomonas aeruginosa. Also effective against pathogenic fungi, Trichophy digiatale. 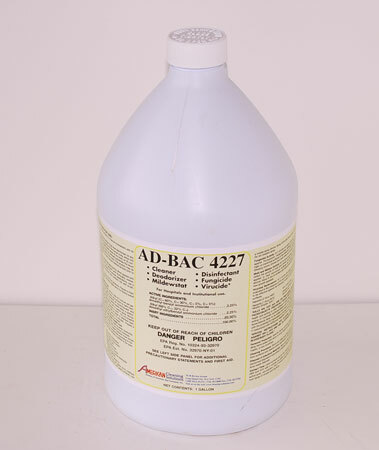 Ad Bac 4227 is a cleaner and disinfectant designed for institutional use such as hospitals, nursing homes, and institutions where housekeeping will be of principal importance in controlling the hazard of Cross-Contamination. Hard surface disinfection can help in this control and can provide the assurance you need area, when used as directed for use on floors, walls, sink tops, garbage pails, telephones, restrooms, bedpans and operating rooms. Effective against Staphylococcus aureus, Salmonella choleraeuis, HIV (Aids Virus), Pseudomonas aeruginosa. Also effective against pathogenic fungi, Trichophy digiatale. Pleasant lemon fragrance, Disinfectant, Cleans, Deodorizes, Non-Corrosive, Non-Staining to plastic, tile, enamel, synthetics and most common metals. Use at 2 ounces per gallon. This product will be effective against Pseudomonas aeruginosa PRD-1 level. 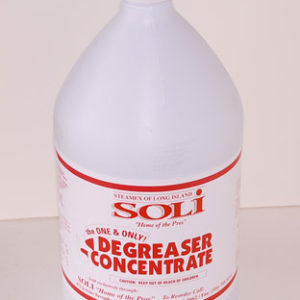 For best results use AD-Bac4227 with a cloth or mop. Surfaces must remain wet for 10 minutes. For heavy soil or matter, a pre-cleaning step is required.